Grilled Pork Chops, Thyme for Cooking's Healthy Weekly Menu. 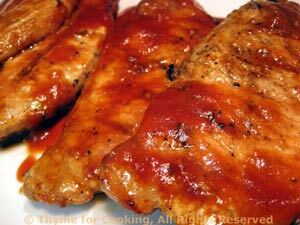 This barbecue sauce will be used for 2 dinners this week - or more chops. The Pasta Salad is also for 2 dinners and can easily be doubled for a picnic for more. Top and tail green beans and cut into 1" (2.5cm) lengths. Add to the boiling pasta for the last 4 minutes of cooking time. Drain and rinse kidney beans and put into a large bowl. Cut cherry tomatoes in half and add to red beans. Slice celery and add to beans. Snip chives, basil and add to beans. Add vinaigrette to beans and toss gently to combine. 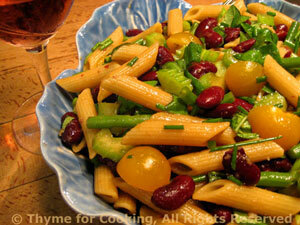 When pasta and green beans are done drain well, rinse briefly with cold water, drain again and add to red bean mix. Mix soy sauce, vinegar, oregano and garlic in small bowl. Add oils and whisk - mixture will not emulsify (thicken) but should be well blended. Note: This salad keeps well 3 - 4 days.